Anand starts with his childhood in Gurdaspur, Punjab, where his father was a lawyer, cruises through the ‘golden’ 1950s and 1960s in Hindi cinema and ends with himself in a Croatian town, imagining the settings of his next film, When Heartbeats Are the Same. 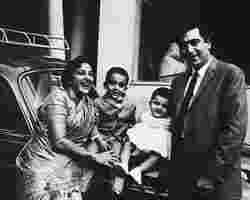 Look for numerous anecdotes on his lady loves, including Suraiya, whom he says he loved deeply, adding that he couldn’t have been what he is today had he married her; his marriage to Kalpana Kartik and their children, Suneil and Devina; the mehfils at his elder brother Chetan Anand’s house, a hub for young talents at that time such as Zohra Sehgal, Pandit Ravi Shankar and Dilip Kumar; and his brush with the best of Hollywood in the US after Guide became the first official Indian entry at the Oscars in the foreign language film category. If you skim through the superfluous prose and some of the annoying repetitions (the book could have easily been cut by 100 pages) and concentrate on the real-life titbits, it is quite a treat. By Dev Anand, Penguin, 448 pages, Rs695. The writing is conversational and simple, detailed by memorable moments and phases in the Dutt family. The most interesting bits are in the first 100 pages, when the daughters sift through their parents’ early photographs and letters. The photographs are pulled straight out of old family albums. A few of the couple’s photographs have a single caption: “Children don’t often think their parents are capable of romance... Writing this book allowed us to glimpse into the way Mom and Dad experienced small and big moments of their lives. It was so moving to read Mom describe their quiet and discreet engagement: ‘Our engagement party was held on Tuesday after 12 o’clock at Bilimoria in our small room with the moon as our guest’." The second half has letters by Sanjay Dutt from jail, Sunil Dutt’s trauma at his son’s imprisonment, his joy at the weddings of his daughters and son and the birth of his grandchildren; and his own political journey. Roli Books, 199 pages, Rs695. What more can you write about Shah Rukh Khan? Two biographies later, this is another— meant to be a “mid-career assessment...by analysing various phases of Shah Rukh’s career and revisiting some of his best and worst films". Deepa Gahlot’s King Khan does so with little involvement from the actor (his quotes in the book could have been for any newspaper article; they say nothing new about him: “I cannot repay my fans for what they have done for me...the only thing I can do for them is to never stop working, to do films till the very end..."). Instead, Gahlot uses her own observations and conclusions as a film journalist who has tracked his journey with curiosity. The directors who have worked with him—including Yash Chopra, Aziz Mirza and close friend Farah Khan—only have praises for his star power. Chopra recalls one of his early films, Darr: “He played to the gallery. The famous stutter was written in the script, but he did it so well. (It) could not have been done subtly... But he caught the right sur and stayed with it." The book’s design is poor, spoiled by loud colours and cluttered visuals. Almost all the photographs are stills from Khan’s films, nothing we have not seen before. By Deepa Gahlot, Roli Books, 123 pages, Rs495. Along with Mohammad Rafi, Kishore Kumar and Hemant Kumar, Manna Dey is a legend of Indian playback singing from the 1950s and 1960s, when melody determined great music. Dey was never as revered as Rafi and Kumar, but he had, and still has, a loyal following. Written originally in Bengali and translated into English by Sarbani Putatunda, Memories Come Alive: An Autobiography is a tell-all about the singer’s life and a chronicle of the musically rich times when he worked in the film industry. Dey pays homage to his uncle, K.C. Dey, a music director and his mentor, and to many others such as Salil Chowdhry, S.D. Burman, Shankar Jaikishen and the Bengali singer Pankaj Mullick (known more for his rendition of famous songs by Tagore). He writes why he finds Asha Bhonsle a more versatile singer than Lata Mangeshkar, and about Rafi’s plight when Kishore Kumar replaced his status in the industry, his own kite duels with Rafi, and many other interesting nuggets from the world of playback singing. 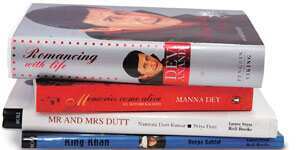 A CD of some of Dey’s greatest songs comes with the book. By Manna Dey, Penguin, 415 pages, Rs450. This recent memoir got attention for all the wrong reasons. Vyjayanthimala Bali, actor, dancer and ex-member, Rajya Sabha, goes back to her days as a classically trained dancer (considered one of the best of all eras in Hindi cinema) and her later years as a politician. What got the book publicity is Rishi Kapoor’s public attack on her after reading chapters where she talks about her alleged relationship with Kapoor’s father, Raj Kapoor. Bali wrote that the rumours were concocted by the showman, who played the lead opposite her in ‘Sangam’ (1964), to gain publicity for the film. The legendary playback singer of the 1930s and 1940s, who left the country after Partition, continued to have a following in India. Pakistani journalist Aijaz Gul tells her unique story—from the time of her birth in Qasoor, Punjab, till she became a singer and actor in Mumbai’s film industry. Gul talks about her visit to India in 1982—her first after Partition—when Dilip Kumar and Lata Mangeshkar welcomed her and her fans got to hear her sing ‘Awaz De Kahan Hai’ (a hit from the 1946 film Anmol Ghadi) live.